Today I'll make some review post...guess it's my first anyway. I've ordered Create Eyewear Double Green from my friend's store. 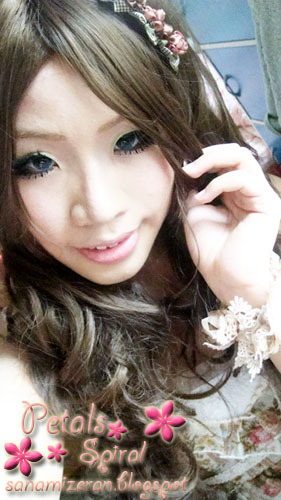 Actually,it's not big eyes lens but it's cosplay lens. I love bright color lens and that's why I decided to order it. I forgot to take pic of my normal eye color,but well I'm pure Asian with deep natural black eyes. And another thing,I want to show you my new Liz Lisa bag. Oh,almost forgot that recently I've bought a new wig also. It's very long that it reached my waist! !